My desired condition is fairly wide. I don’t care if a pony is MIB or not. I obviously prefer if I don’t need to clean up or anything but am more lax for say G1 ponies. I would prefer ponies with no marker/pen/highlighter markings, no pony cancer, no bald ponies, no body parts missing (flutter wings okay obviously), prefer they come from non-smoking homes. Just mainly I would like them in display condition. Or worst case, easy fix to display. I don’t have any allergies, thankfully. I dislike orange and mint flavoured chocolates. I love chocolate (milk & white preferably), gummy type candies are always a plus, I enjoy cookies this time of year. Basically I like everything except orange and mint flavoured chocolate. I am a pony nerd but also love all things Disney. Anything and everything Stitch is also my jam. I am a huge Harry Potter fan as well and I am SUPER into Fantastic Beasts Niffler baby things right now. I don’t know why I’m fixated on them right now but I am. So cute!! So I do love the POP! Figures of all the Fantastic Beasts creatures as well. Here’s photos of ones that I’ve had questions about previously, just to make things easier on everyone. I looooove Christmas! Almost everything Christmas! XD I love snowflakes, snowmen, reindeer, Santa, Christmas carols, Christmas trees, ornaments... Pretty much anything Christmas-y. :3 I also love plain milk chocolate (though I don't like chocolate with nuts in them - no allergies, just a preference). I love Disney, particularly the Disney ducks (Donald, Ducktales, etc)! I also love and collect pins (Disney and Olympic pins mainly, but anything goes! ^__^ ). I love video games, with titles like Zelda, Mario, Final Fantasys 6 & 7 and Chrono Trigger/Cross being among my favourites. Back to the Future is a huge favourite of mine, as is One Piece (Zoro and Sanji are my favourite characters). I prefer ponies without cancer, major pen marks and major hair cuts. I'm not keen on regrind but a couple of small spots are acceptable. My favourite colours are pink and blue. For christmas I like the classic christmas colours such as red, gold, green. I also like the blue/ silver combo! Favourite animals: cats, owls and rabbits. I like cutie christmas things like snowmen, snowflakes, penguins, reindeer and santa! I also like the grinch. I love Christmas tree ornaments, we are having 2 trees in the house this year! I like drinking coffee and hot cocoa especially topped with marshmallows! I don't drink tea! I'm not too picky, no major hair cuts, or really bad marks, no chewed on or missing limbs LOL! But little flaws or marks and such don't bother me. I know I've got some pricier ponies on my list, it's just the natural way since I'm close to finishing the US collection but I am totally happy with accessories! I like cooking/baking and decorating for the holidays. I decorate every room in the house. I'm not very religious so my decorations are more like Santa, reindeer, snowmen... I love Snoopy/Peanuts, Eeyore, Garfield and I also collect Charming Tails. I have a piebald dachshund, Frank who is my fur-baby so I tend to collect dachshund stuff too. I also collect gnomes and I like mice but not Mickey, nothing against good 'ol Mickey but I just like cute mice stuff. I like fun socks and jewelry, particularly earrings. If you're a good cook I also love to get people's tried and true recipes! None! I am trying to diet though, so little or no treats is ok with me. If you find you can't resist, I like chocolate, peanut butter and toffee. If you're international, I do love trying new things from different countries. I'm super easy to buy for because there are so many choices. I'm also easily excited and easy to please. I'm missing a ton of G1's. I love G1 merchandise and stickers. Not a super picky collector, but no cancer, regrind, highlighter, smooze, or marker please. Marks on hooves are ok or small marks that aren't super noticeable or make come off. Not keen on major hair cuts or missing plugs, but for harder to find ponies, this is fine, because I will put in the time to restore. I love Christmas, but as I'm trying to downsize, I prefer consumable Christmas treats to decorations. I'm not crazy into sweets, but I love Waterbridge Wine Gums, Red Licorice and good quality dark chocolate. I wouldn't say no to any pony, 80's or Monster High tree decorations. I absolutely love handmade things. Any G1 accessories, stickers or combs. I also love Monster High and I don’t have any version of the dolls listed below yet. I prefer dolls with clothes, and shoes at least. I just copied my list from the Halloween swap and didn’t even think to look at my G1 list. Thanks for keeping an eye out for me. @Uftaki - where do you itemize your want lists like that? It’s so fancy-dancy. 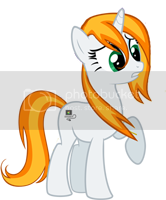 How I made them is I get the pictures of the ponies + info (year, group, etc) from other sites. Then I make a blank grid in MS paint, and type in all the information onto that grid. Pictures are re-sized in Gimp (another picture-editing program) and popped into the grid at the same time. Photoshop or Gimp may be "easier" with their layers, etc. But I'm not the best at using those, and I like the simplicity of working with MS Paint. ^_^; I have a bunch of files, now, for each generation I collect (both blank and checked versions). @Uftaki - your lists are amazing. I love to have checklists with pictures. You have saved me time when checking to see if I have certain ponies and especially with the G3's because you arranged them by colour, which is super helpful. While we are on the subject, your G1 list has decreased to one a few ponies. Are you almost complete for G1's? @Cactusflower - thank you. ^_^ I love having them, too. Glad to have helped you with them! My G1 list here on the Secret Santa is actually a shortened list, of ponies I think are a little cheaper and/or possibly easier for people to actually find. The others I still need would be very hard to find, and/or too expensive. ^_^; (I still need about 60+ to complete my G1s). I would be thrilled to have any of the fancy pants babies except for the green one - sunnybunches I just got her to go along as another blossom baby since I love making pony families. I'm not really too picky... as long as she displays nicely, I'm good. G1 and G3 are okay not to be MIB. G4 MIB is preferred, but not mandatory. Hot Chocolate, especially peppermint flavored! I got into Kinder Joys this year... the tiny toys go on my computer at my new job, and I love the frosting and wafers on the other side of the egg. I love all things Christmas. Can't really go wrong with Christmas for me. I especially love angels. Thanks to doing some pony-related work for MustBeJewel, I'm starting a Derpy army. Anything you can find to add outside of the Wal-Mart stuffed toy, the small brushable and the Stuff Happens sticker is very welcomed by me!!!! Anything you can find with Discord is also welcomed by me... I just LOVE him.